Past several weeks you have heard a lot about the development of a certain secret project. In the V-LOG 171 and 172 we have lifted the curtain a little bit, and now it’s time to reveal the full details of the coming update, since its release is set for tomorrow, June 4th. With the release a brand new and different mechanic will be added to the game — drones! Drones are your helpers in battles. They boost your stats, enhance supplies and help in many other ways. Drones can be purchased with crystals in the Garage in the “Drones” section. Also in there, you will be able to upgrade them. To use the drone, you need to equip it, same as any other gear. Equipped drone will appear in battle above your tank and will follow you, everywhere. Drones will automatically trigger following a specific event or action in battles — you don’t need to activate them yourself. After the activation drones will become inactive until they are automatically recharged. «Mechanic» drone gives an additional HP bonus to the instant Repair Kit effect and will also heal all nearby allies, same as it works with overdrive. Will automatically trigger after using or picking up Repair Kit supply. «Assault» drone will trigger after destroying enemy tanks and prolongs the effect of all active supplies. «Trooper» drone will activate all supplies — Double Damage, Double Armor and Speed Boost — right after spawning, when your tank becomes fully visible. Your personal supplies are not used for the effect. Drones will be powered by special batteries. 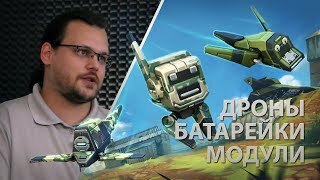 Batteries are the new supply type, which will be automatically used in battles, when you have any of the drones equipped. Same as other supplies, you will be able to purchases batteries in the Garage and in the Shop, find within the containers and, of course, win in contests. 1 battery costs 300 crystals. Drones use 1 battery per minute. After the update you will be able to construct your own protection module from modules with a single protection. All current modules will be removed from the game and replaced with modules, each with a protection against a specific damage type. This way, you will find in the game 14 modules overall — 13 for turrets and 1 for mines. These modules can be combined in any order, creating your own protection with the maximum of 3 modules per combination. Now you won’t have to spend tons of crystals upgrading the same protection type in several different modules. You can create any combination of protection types. It’s easy and quick to change protection within the module. Protection can be changed in the Garage. Navigate to the “Modules” section, press on any module, and you will see 3 slots. To add the protection into a free slot, you need to choose the module you want and press on “Equip”. If you want to remove the protection or replace with another protection type, press on the slot with the protection you want to remove. As before, modules will have modifications and can be upgraded. We hope you will like the new mechanics, since we haven’t seen anything like it in TO before! As always, we welcome you to post thoughts on the new update on the Forum.